Just a normal day. Erin was quite happy how things were, studying biology and off to see her boyfriend. He, however, was about to change everything. Her boyfriend, Terry, wants her to just watch him as he listens to a tune. He says it will be a special experience. She says he should stop joking but since he insists she gives him what he wants. After all, it's only wasting a few seconds of time. Terry puts his headphones on. The next moment - the bedroom no longer exists. Erin has entered another world. She can only call out as she sees Terry across a bridge from where she is standing just moving away from her. Further and further away. Then, she is alone with nothing around her. What has happened? 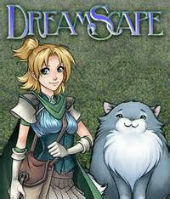 Will Erin pierce the secret of Dreamscape? And will she ever find Terry again?